A compilation video of how Boko Haram terrorists observed Eid-el-Fitr in various locations of Sambisa forest has surfaced on the Internet. A journalist with access to the terrorists, Salkida had earlier tweeted the screen shots of the compilation video, saying the terrorists performed the prayer despite “unrelenting air-strike” by the Nigerian Air Force. 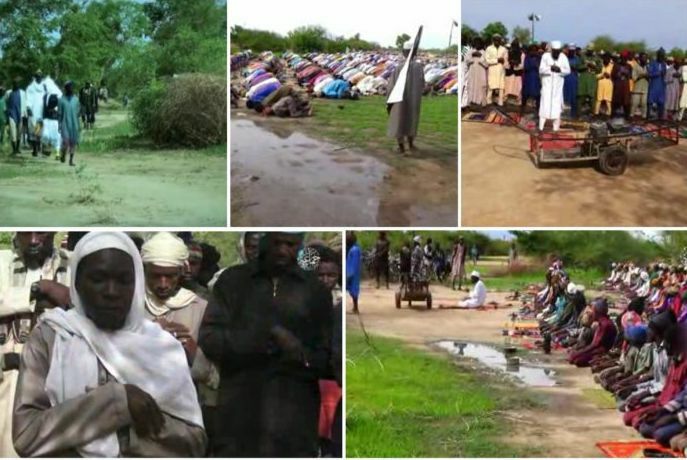 “#BokoHaram observed #EidPrayers despite unrelenting airstrike’s by the #NigerianAirforce. A video released moments ago by the #AbubakarShekau led group shows hundreds of fighters and villagers praying in an open field, apparently between the Nigeria-Cameroon border,” Mr Salkida wrote. Mr Salkida further tweeted that the videos emanated from the faction of Abubakar Shekau, believed by experts to be losing grounds. “Evidently, from #BokoHaram latest #EidPrayers video, the prayers were held in three different locations, spread around the Gwoza axis, which is the group’s stronghold. We hope this senseless bloodbath will soon come to an end,” the journalist posted. The terrorists habitually sent similar propaganda videos during Sallah celebrations. On Saturday night, no fewer than 32 persons were killed, while 84 others were injured when six suicide bombers detonated Improvised Explosive Devices, IEDs, in Damboa local government area in Borno state.